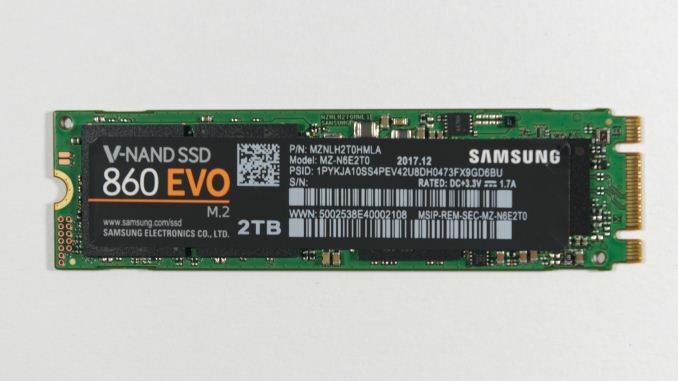 Samsung's update to their TLC SATA SSD is not quite as impressive as the improvements the MLC-based 860 PRO showed, but the Samsung 860 EVO's gains are still enough to put Samsung back on top in that product segment. The competition had caught up to the 850 EVO and surpassed it in several cases in recent months, but Samsung can still deliver a top-notch SSD. The 860 EVO's performance did not improve in every metric, but on most of them it is slightly faster than the 850 EVO and it is usually as fast as any other TLC SATA SSD. The small handful of regressions should not have much effect on normal use and are not particularly severe even on synthetic benchmarks. The Samsung 860 EVO's power consumption never goes much above 2W, regardless of the workload. At idle, it uses less power than any other drive in its class. However, total energy usage on our ATSB tests is still trailing behind some of the competitors, so the 860 EVO isn't the unqualified best choice for maximizing battery life. Overall, the performance and power consumption of the Samsung 860 EVO make it a worthy successor to the 850 EVO. It does not offer any compelling reason for current users of an 850 EVO or similar SSD to upgrade, but the improvements are measurable, if otherwise usually imperceptible. For new systems, the 860 EVO is a reasonable offering for today's market, provided the price is right. Looking specifically at 2TB M.2 SATA alternatives to the drive in this review, we find the WD Blue 3D NAND is $50 cheaper, and the 860 EVO is definitely not worth $50 more. Broadening the price comparison to include 2.5" models, the competition is much stronger. The 860 EVO is still selling at MSRP, and those prices are not competitive. The 2TB Crucial MX500 for $500 makes a lot more sense than the 2TB 860 EVO for $650. Across the full range of capacities, Samsung is trying to continue charging a premium that their product no longer justified, because the alternatives are just as good. 30¢/GB should be about the upper limit of pricing on the 860 EVO, instead of being the lower limit. As 64L 3D TLC finds its way out to other brands and as the other NAND manufacturers start supplying their 512Gb 64L TLC parts in volume, the competition will only increase. Samsung's reputation can guarantee the 860 EVO a lot of sales, but there are better deals out there. How long has this drive been out???! Because I've been looking for an affordable 2TB option for the past half year and can't believe I never found this one.